She’s a street style fave and her wardrobe is the kind that’s so fashion forward you’ll feel so last season just looking at it, but such is the sartorial prowess of Vogue Australia Fashion Director, co-founder of brand Wardrobe.NYC and uber stylist, Christine Centenera. The thing with Christine’s style is that it’s so uniquely her own. She’s crafted a look thats polished, edgy and achingly cool and it’s become her signature. Favouring dark, moody colours (especially black) and pieces that are sharp, tailored and have a feature or detail that sets it apart, it’s no wonder that she’s always atop best dressed lists worldwide. Whilst her look is one that’s hard to replicate there are a few elements of it that you can adopt in your own wardrobe. Firstly, embrace the power of black. It’s forever chic and is one of the easiest ways to look sleek and sophisticated. And adopt silhouettes that are strong and structured —think power blazers and streamlined pants and skirts. 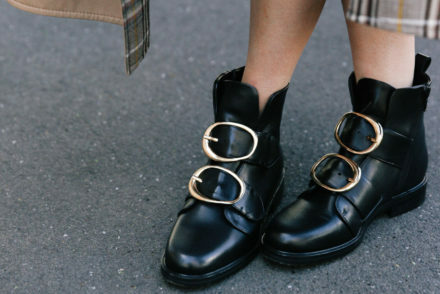 Also, learn to fall in love with ankle boots and pointed pumps, which heavily feature in her outfit repertoire. Lastly rock it with confidence to spare.